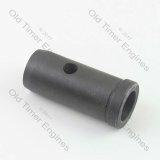 A new exhaust valve guide to suit all Lister CS, JP, JK and JS engine types. 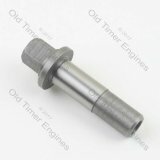 This is a high quality reproduction of the original threaded type exhaust valve guide and is compatible with genuine Lister engines. 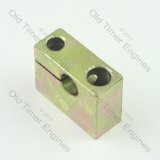 A new quality Lister CS type Inlet valve guide to suit all Lister CS & JP engine types. Pair of high quality replacement Lister CS inlet and exhaust valves. Made from original specification EN52 grade steel, these precision ground replacement valves are made to high standards. Note: These valves are not suitable for Lister CS 3-1 or 3.5-1 engines. 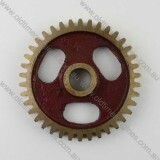 A replacement 1/8 BSP thread brass greaser and steel extension piece for the Lister CS rocker gear. 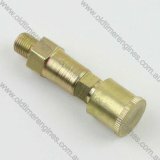 Could also be used for any other application requiring a 1/8 BSP thread brass greaser. A replacement rocker block for Lister CS 5-1, 6-1 and 8-1 engines. Brand new Lister CS bronze idler gear, this is a precision machined replacement idler gear made from bronze, arguably superior to the equivalent cast iron version due to its lower noise qualities. 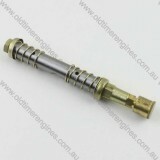 A good quality replacement cam shaft assembly for single cylinder Lister CS engines. 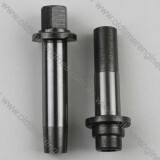 This cam shaft is suitable for use in 3hp, 3.5hp, 5hp, 6hp and 8hp single cylinder Lister CS engines. 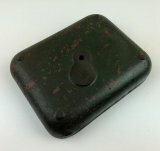 A new cast iron replacement camshaft end cover for use on all single cylinder original Lister CS engines and Indian copies. A replacement fuel and oil pump cam lobe for the Lister CS cam shaft. Often worn due to lack of lubrication. 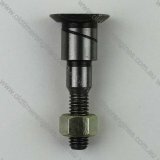 New replacement Lister CS idler gear bolt, used for bolting the timing idler gear in place while still allowing it to turn. 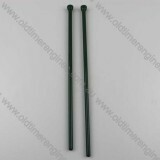 Pair of good quality push rods to suit Lister CS 3-1, 3.5-1, 5-1, 6-1, 8-1 and possibly other Listers & Listeroid diesel engines. Includes 2 green powder coated push rods, inlet and exhaust, the exhaust rod is slightly longer than the inlet. 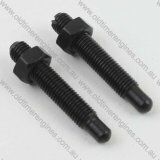 A new replacement pair of valve rocker adjusting screws and lock nuts Lister CS engines. 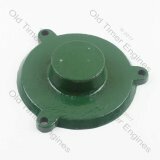 Suitable for use on all sizes original Lister CS engines and Indian copies. 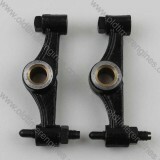 A quality replacement bronze bush for original Lister CS valve rocker arms. Sold individually. 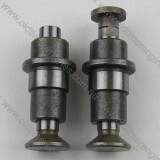 Pair of good quality Lister CS rocker arms complete with valve rocker adjusting screw and striking pin. A complete Lister CS Rocker Arm Shaft assembly complete with brass greaser. 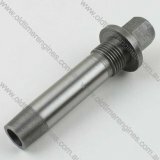 This rocker shaft will fit all size engines, including 3-1, 3.5-1, 5-1, 6-1 and 8-1, the springs and end caps are spare when used on the 3-1 & 3.5-1 engines, the shaft is the same. 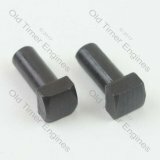 A pair of new replacement valve rocker striking pins. These will fit all genuine Lister CS engine sizes. 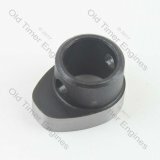 A new replacement camshaft end bearing for Lister CS engines. 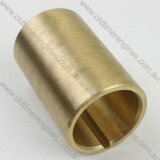 This bearing is for the pressed tin cover end of the cam shaft only, the bronze bush for the governor end can be purchased separately in our store. 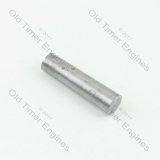 Suitable for all Lister CS engine sizes. 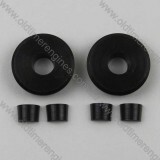 Valve guides to suit Lister CS and Listeroid engines. These valve guides are both press fit. A pair of valve spring cup/carriers and valve stem collets. 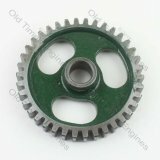 Includes 6 parts in total, 2 valve spring carriers (10-3-130) and 4 cotters (10-3-25). 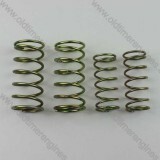 Full set of 4 valve springs for Lister CS, Listeriods and other engines, included are 2 x inner valve springs equivalent to Lister part number 11-3-219 or 012-03219, and 2 x outer valve spring equivalent to Lister part number 10-3-129 or 012-03129. 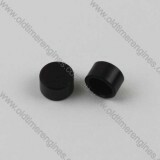 Pair of valve stem caps suitable for Lister CS engines. Hardened to improve wear resistance. No6 taper pins for locating the cams on all Lister CS cam shafts. Note: This is the shorter pin for securing the cams, a longer 2” pin is required for the cam shaft end bush.